Platinum is a beautiful and stylish guest house with stunning sea and mountain views. It is set high above the magnificent Hout Bay Valley, the ideal place to enjoy the Cape Town area. This elegant house with its outstanding finishes is perfect for the modern pleasure and business traveller who is looking for state-of-the-art equipment such as an Apple TV and Wi-Fi. Nestled some five minutes from the beach, Platinum Guest House is ideally situated to take full advantage of all points of interest both locally and throughout the Cape Peninsular, providing ample opportunities for the most adventurous and a host of gentle pastimes for the weary traveller. 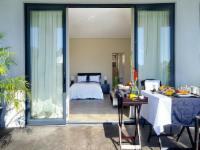 Complete your fond memories of Hout Bay and Cape Town by allowing us to offer you the most enviable views in Hout Bay. Platinum Boutique Hotel is 12.8km from the centre of Cape Town , the nearest airport 28.2km (Cape Town International Airport).